Find out several ways to increase energy efficiency and make your home a little greener during Energy Saving Month. 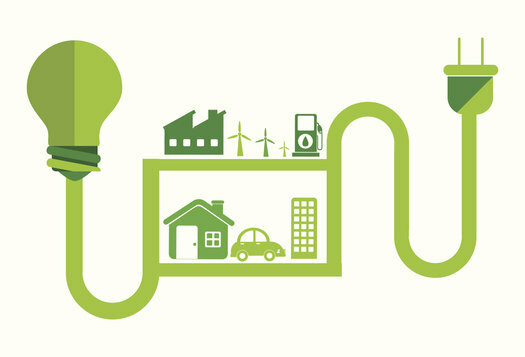 Did you know that September is Energy Saving Month? Well, now you do! This month is dedicated to helping homeowners, like you, better understand home energy use and how to minimize waste and save money. That’s what we like to call a win-win. So, without further ado, here are several ways to cut energy waste. “If you really want to cut back on your energy use, you need to focus on heating and cooling your home,” said Maria Vargas, spokesperson for EnergyStar. Did you know that heating and cooling accounts for more than half of the energy use in the average home? That’s right. HVAC is the largest energy expense for most homeowners. One way to help curb energy usage all year round is to invest in a programmable thermostat. By turning your thermostat back for eight hours, you can save as much as 1% for every degree, according to the U.S. Department of Energy. Did you know that ceiling fan rotation also plays a big role in the energy efficiency of your home? When your ceiling fan rotates clockwise (winter) it recirculates warm air that is trapped on the ceiling. Conversely, when your ceiling fan rotates counterclockwise (summer) it pushes air down, and moving air always feels cooler. By simply switching the rotational direction of your fans during heating and cooling season, you can help supplement your HVAC system and save energy. VerifEye smart meters provide actionable data that, when acted upon, can result in long-term cost savings of 15% to 20%. With VerifEye™ high-quality electric meters you can receive accurate reporting of the energy usage and energy demand of your entire facility, individual tenants, departments, and even individual pieces of equipment. Our staff is comprised of experienced, skilled craftsmen who value professionalism and can (and gladly will) handle all of your lighting and electrical needs, large or small, from electrical design and consultation to generator maintenance, custom lighting, and even small jobs. We proudly serve Maryland, Southern Pennsylvania, Northern Virginia, and Washington DC. If you would like to know more about Energy Saving Month or home energy wasters, please contact TriStar Electric by calling 410-799-5791 or 301-384-8880. We are available during normal working hours, and we service most parts of Maryland, Washington, DC, and Northern Virginia. This entry was posted on Thursday, September 17th, 2015 at 3:50 pm. Both comments and pings are currently closed.